Maybe that's why the group was served a "compressed avocado" salad with onions, greens, yellow pepper and goat cheese. The main course: a breaded fish with risotto and vegetables. Obama told the table he thought dessert was delicious. It was described to CNN as a "chocolate brownie-like cupcake thingy with warm chocolate over it." The dessert probably went down more smoothly than the president's spin. Our seating chart of the lunch is based on reports in the room. 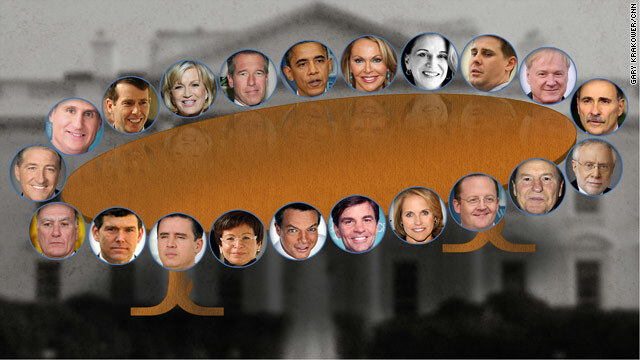 Seated L-R, beginning with the person seated to the president's left: Maria Elena Salinas of Univision; NPR's Renee Montagne; White House Communications Director Dan Pfeiffer; MSNBC's Chris Matthews; White House Senior Adviser David Axelrod; CNN's Wolf Blitzer; Jim Lehrer of PBS; White House Press Secretary Robert Gibbs; CBS' Katie Couric; ABC's George Stephanopoulos; FOX News' Shepard Smith; White House Senior Adviser Valerie Jarrett; CNN Espanol's Juan Carlos Lopez; FOX News' Brett Baier; White House Chief of Staff William Daley; CNN's John King; Telemundo's Jose Diaz-Balart; White House Senior Adviser David Plouffe; ABC's Diane Sawyer; and NBC's Brian Williams. CNN's Emily Schultze contributed to this report. Where is the information explaining the "long standing tradition" of this reporters luncheon? As a newsman/organization, where is the who and when to back up that statement? Still waiting for the history of reporter/president lunches before the state of the union speech.